Sumptuary Laws and high import duty have often meant that smugglers could reap rich rewards, ‘Brandy for the Parson, Baccy for the clerk, Laces for the ladies’ are cited in the Smugglers Song by Rudyard Kipling. In the 18th century one way of getting lace into the country was in the coffins of British subjects who had died abroad. 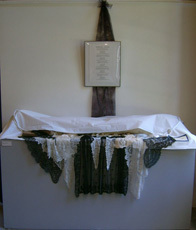 Coffins were made large enough to accommodate both the body and large quantities of lace. One report says that when the body of Bishop Atterbury was brought home from Paris in 1731 the high sheriff of Westminster found £6,000 worth of lace in the coffin. Soon the coffin contained only lace and enough stones to give it an appropriate weight. To divert suspicion the coffin would be met at the port by mourners, buried with all due respect and then dug up at night to retrieve the lace. A suspicious rise in the number of coffins entering the country led to orders that all coffins must be opened for inspection. Today rather than open coffins, to look for lace, customs officials X-ray them and use sniffer dogs to search for illegal drugs. Today many methods are used to bring in drugs; traditional smuggling ploys such as using small boats to land contraband in secluded coves are still employed. Packages of drugs are now hidden in sacks of coffee beans and rice that would once have contained other banned or heavily taxed items. Perhaps the most disturbing new trafficking method is the transportation of drugs inside live bodies, swallowed by humans and surgically inserted into the body cavity of dogs. Not all of these drugs mules survive their journeys, if a package ruptures before it passes out of the system then the carrier will die. ‘Old tricks, new trade’ shows a modern body bag with its illicit contents spilling out. The old trade is represented by lace including Chantilly and Blonde. The new trade is represented as some of the packages of class A drugs, worth £3 billion, seized by the Serious Organised Crime Agency in its first year of operation which included 73 tonnes of cocaine, 1.5 tonnes of heroin, 4.4m ecstasy tablets, 260kg opium and 1m doses of LSD.